Why upgrade from free version? This remote access application lets you control just about any computer anywhere. The Pro version of LogMeIn is the next step up from the very popular LogMeIn Free, which as the name suggests is the gratis option. As you might expect, the Pro version offers a host of extra features over the free tool, such as printer sharing, file transfer and desktop sharing. However, you should really decide if you absolutely need those before stumping up the £41.20 a year to upgrade. The extra tools are very interesting, but how often would you need to print to a machine you're not near or transfer files between machines (bearing in mind that you can use a tool like Dropbox to achieve the same result)? The other thing to note is that Mac users are shortchanged. 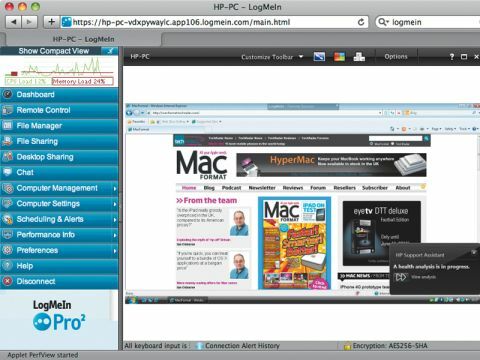 The Windows version of LogMeIn Pro2 costs exactly the same as the Mac version, yet the Mac app has fewer features. In use we can't fault LogMeIn Pro 2 – it's fast and responsive, although this is reliant on the internet connection you have, of course. The management of logging in and adding machines is a breeze too. While the interface is a little rough around the edges, there is otherwise little to fault. For the kind of troubleshooting and remote access that most consumers might need, LogMeIn Free is perfect, but if you need the extra things, £42 a year per machine isn't too high a price to pay. Remember, however, that PC-using friends are getting more for the same money.